In this mobile society, people are reading less when it comes to their communications. Attention spans are short, and with the crush of information thrown at us each day, there is limited time to listen to each seller's message and review buying options. Hence, we see the 15-second commercial and the massive popularity of Twitter. When buyers take the time to read the text for your app on the Android Market, they are interested in downloading it. • List any promotions, discounts, sales events at the top of the text to meet the demands of any of your impulse buyers. Use asterisks to call out a sale or noteworthy review or event. • Post solid magazine, newspaper, or other leading reviews of your app next to the top of the text to reinforce the value of your app from the start. Testimonials, especially from well-known publications, can influence your sales. 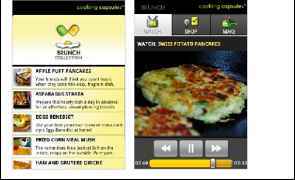 Cooking Capsules Brunch is a collection of 8 tasty brunch recipe "Capsules". Provded in each Capsule: ■ Photo, info Stools needed ■ Short how-to cooking show ■ Grocery shopping checklist ■ Recipe steps checklist By the makers of Cooking Capsules Taster, Top 20 winner of Google's Android Developer Challenge! Figure 5.9 Android app example with good balance of text. • Describe what your app does in a few quick sentences. The reader wants to know right away! • Talk about the benefits of your app towards the top of the page (feel better today, hours of fun, lose weight fast, learn this skill now, improve your health, and so on). • Use short paragraphs to describe your app. Two to three sentences work well. Avoid big blocks of paragraphs. Most app buyers will skim through the text and won't read it completely. • Use bullets to describe your features. Bullets help lead the reader through the key points of your app, and readers are accustomed to going through bulleted lists. • Include a note to have the buyer look at your other apps as well if you have them up on the Android Market. • Include a "What's New" section describing the latest updates (if it is an updated app, of course). • List any updates that are coming up in a "What's Coming" section. • Review your text periodically to make sure it's still reading the way you like. Sometimes, rereading text after a few days or weeks helps us to see things in a different light. Have someone else take a look at the text to make sure it's on message. There is an exception to the short text rule, and that's in the book category. Sometimes it helps to include a compelling paragraph from the book. Whenever the reader might be interested in seeing an excerpt, go ahead and include it. The Android Market does provide an ample allowance.